Let me begin this post by saying that for the first time ever, ViperChill has crept under the 10,000 Alexa mark (!). The number doesn’t really mean that much, but it is nice for a site owner to see. What’s even more surprising is that I didn’t write a blog post for weeks. I guess my ideas have merit *wink*. Today I’m going to reveal exactly what I’ve discovered about making money with blogs over the last four years. Your fellow blogger does not want you to see this because these simple tactics are guaranteed to help you make more money from blogging, and (possibly) reduce the potential income they can make themselves. When I started my first blog ViperChill four years ago, it was a total failure in the normal blogging sense. I didn’t receive any comments, I didn’t gain more than 50 subscribers and nobody really linked to me. Yet financially, the blog was quite successful. It frequently attracted clients who were happy to pay thousands of dollars each month for my services. Thankfully, these people were not looking for advice on growing their blogs, but on SEO, where I had attracted a lot of success in multiple industries. I came back to this site on and off over the years. At times I made a respectable income from it, but overall, the effort that went into writing was just not worth the money I was making. If truth be told, my writing was awful, so I can’t complain. I spent a lot of time away from blogging and focused on affiliate marketing and other tactics, having fleeting (but more consistent) success in the process. It wasn’t until a couple of years later that I decided to give blogging one last try. I built a site in the personal development niche called PluginID. Most of you know the story of that website, so I’m not going to go into it here. What I haven’t talked about however, is the monetisation strategies I would regularly observe in that niche. It just so happens that now would be a good time to do exactly that. I have a lot of friends in this industry, after being involved in it for so long, so I’m not going to talk down or anyone or point out anyone in specific. I’m also not going to be harsh, but just point out exactly what I observed. People follow what other people claim to make them money. For this reason, many of the strategies in place today when it comes to making money, are from people who talk about making money. And to find the people talking about making money, you just need to take one peak at the internet marketing niche. In the personal development industry – and pretty much all others – the main way that people make money is by creating their own products. At least that’s how it goes for blogs that aren’t reliant on Adsense or banner ads. We see internet marketers creating products and making money. Then they talk about making money by creating products. And then bloggers look at how they can make money with products as well. The result is an internet literally flooded with information products (eBooks, online membership sites, video courses, podcasts) on every topic you can imagine. Since we’ve followed internet marketers on how to make money in terms of product creation, we then need to look at them for how to sell those products as well. So, we create landing pages like they do and create affiliate programs like they do. It works, so we continue to use their tips. The problem is that none of these big gurus in the IM niche started out by building blogs first. Instead, the majority rely on email marketing. Their strategies work well for how they build traffic, but who’s to say they’re really the best example to follow for your blog? Surely there are other blog specifics ways to increase the income you make by selling products? The method I’m personally going to use when selling information products is a little different to most. Instead of focusing on the big landing page and worrying about affiliates, I want to take the personal approach. Don’t get me wrong, those things work well and I’ll continue to use them, but I also think it’s time for something a little different. When I discovered writing guest posts was a valuable traffic strategy, just writing 20 or 30 could guarantee thousands of subscribers. Now you have to write many, many more. Because everyone is guest blogging, the value of the tactic has gone down substantially. Though I didn’t discover guest blogging, I was one of the first (if not the first) to talk about it so openly as a viable way to grow your blog. The key lesson from my guest blogging experiences is this: It was only because I tried something different, that results started to happen. Based on that, I believe it’s necessary (critical, perhaps?) that we evolve. Especially when it comes to making money from our websites, which many of us are trying to do. I’ve been implementing the following strategies recently with a lot of success and I strongly believe that now is the time to put them into action. When I launched Cloud Living here in December 2010, I received over 500 sign-ups in the first 72 hours of the product going live. If you do the maths, that’s quite the launch. During the launch period the product converted like crazy, and I also get a lot of sales whenever I write about it in a post. When I barely got any sales at all, is when traffic came from a link in the navigation bar here at ViperChill. This link sent the sales page a ton of traffic. Now, I know my landing page is actually pretty awful, and needs a lot of work, but the conversion rate was just abysmal compared to whenever I mentioned the product in a blog post. The main reason I think the conversions differ so much is because people land on ViperChill, click on the link out of curiosity (the phrase “Cloud Living” doesn’t really reveal much) and then land suddenly find themselves on a product page. Some people probably wonder if they clicked on an ad. That’s a problem, and it showed in the sales figures. I thought about how I could change this for a while, and decided to try something different. Instead of that link instantly taking people to a product page, I would take them to a page on my site that would explain the product to them, and then tell them to click on the product site. This does add a step between any potential sale – which most marketers tell you to avoid – but it massively cuts down on any confusion about what the page is. Still though, the approach was fairly cold. Sales generated from links in posts or my initial launch process converted so well because people were warmed up to getting information from me. They may have been a subscriber for 6 months or they may just be 500 words into your first article by me. Either way, they were more open to my offerings in some way. That’s when I decided to try something new. Cloud Living is something that has helped countless people make thousands of dollars online. I know because I get emails from people telling me so, and also because people are happy to share that information in testimonials. The simple fact is that as long as people follow the information in the course, they will make money. Thankfully, a lot of people are following it. Since I have this awesome feedback from buyers, I wanted new potential customers to see that. So, I added the Facebook commenting system to the page. Then, I emailed all members of Cloud Living and asked if they would stop by the page and leave an honest testimonial. You can see the results for yourself. The comments add a genuine layer of social proof to your offering and excite you about the product before even knowing what it is. Thanks to this, I’m seeing a huge boost in sales already. Another great aspect of Facebook comments is that you can use the same comments in multiple places. 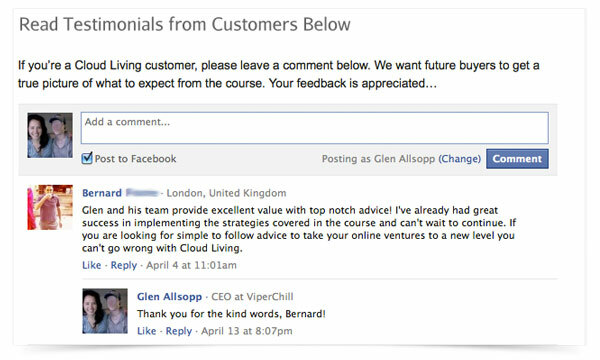 For example, on the Cloud Living back-end I can ask people to leave a testimonial of the product, and then all of those testimonials can appear on my page here at ViperChill. Of course, let someone know that the comment will appear in other places. Being able to transfer and display real feedback from your other customers is very powerful. The second part of my strategy is something I actually haven’t implemented on a large scale…yet. Since people are going to know the plan I have in place now for the future, I’m going to lose a lot of money by telling you all about it. Since I care more about you making money than me at this moment in time, I’ll give you this information to use successfully in your own niche. This method simply involves creating a free product that is similar to a product you do/could actually charge for. The freebie can just be shorter or less valuable in other ways. For example, my plan is to clean up a free blogging eBook I have, and give it away on an independent website. In time, I’ll then ask people if they’re interested in my paid product on the same subject (Cloud Blogging). I like this method because you’re giving value to your site visitors and not losing any credibility in the process. Even if they don’t like your sales pitch, they will appreciate the freebie and any other valuable information you send their way. The aim is to make money from this of course, so the free information will also help people come to trust you as an expert on your topic. This tactic works so well that some people will literally feel obliged to purchase something from you. If you want to implement this method, then you’ll need to start by creating a free product you’re happy to give away, and then place it on a website with an email opt-in box for people to get it. I personally use Aweber for the whole process, as they’re by far the most reliable email provider. Your email list should be set-up to automatically deliver your free product as soon as someone opt’s-in for your list. Keep your message short, and the product links clear. You main aim is to ensure they download the freebie and get value from it. If they don’t download your free giveaway, the chances of converting them through follow-up messages diminishes greatly. In this email you answer the most common questions you may have received about the freebie. If you don’t have any questions, you can simply add more tips which weren’t included in the initial giveaway. This helps you to be seen as the expert in your niche and provides more value to your list subscribers. The four day delay before this message gives people enough time to go through the original freebie. This mail will also prompt a few people to download or view the product who hadn’t yet done so. At this point, people are now looking forward to receiving emails from you. People like to see other people having success with something – other than you – to give them more belief that what you’re saying, works. If you know what you’re talking about then you should know at least one person who has followed the advice you’re giving, in whatever industry, and been better off for doing so. If you pick up a copy of my “10,000 Subscribers” eBook then you’ll see a great case study in there which really shows whether my method works. The more people you see succeeding at something, the more you believe it’s possible for you to do the same. It really is that simple. At the bottom of this email mention that people have been requesting that you go into more detail on this topic, and possibly create a product (if true). In this fourth email it’s time to let people know about your paid product. Remember, this should be a large extension to the information you’re already offering. If you had a freebie about gardening, for example, then create a product around that. Though a product on something like “How to Install Your Own Solar Panels” might be somewhat relevant, it’s not as targeted an offer as it could be. Introduce the product by continuing with your personal style of writing, and make it clear that due to seeing a need for this, you decided to create a product. If you can, offer some kind of discount to thank them for their support. Because of the nature of the next email, we want to ensure that whoever buys the product doesn’t keep getting asked to purchase it. For that reason, you first of all need to setup an email opt-in when people purchase your product. If you’re using something like Wishlist for WordPress (which we use) then you can do this automatically. Afterwards, you simply go to the list Automation rules in Aweber and say that if someone subscribes to the product list, take them off the freebie list. This isn’t crucial, but I do recommend it. Otherwise, you’re just going to annoy people who have already handed over their cash. That’s not something I propose you do. Subject Line: Do You Want the Good News or Bad News First? The final email in your sequence should be an update just after the product launch. While many people will buy from your previous email, other people take either another reminder, or just a little more convincing. The subject line here is catchy and gets their attention. If you can get them to answer a subject line in their head, they’re more likely to open the email to see what it contains. The good news, in most cases, should just be you talking about how sales have been and sharing any positive customer feedback you may have. The bad news, can be whatever you want. A common example of bad news could be that you only have a limited number of copies left, or you will be increasing the price shortly. This hint of scarcity persuades a lot of people to buy your product. Especially people who were previously sitting on the fence about purchasing. Just make sure the bad news is true, or it will damage your reputation. There will be, without a doubt, people on your list who didn’t buy your product, even after the two promotion emails. It may be because your product sales page converts poorly, so always continue to work on that. It may also be because you have what I like to call “Freebie seekers” on your list, who never really intend to buy anything online. Follow-up emails to this list shouldn’t mention your product any time soon. Instead, continue to focus on your topic, but offer other things instead. You could for instance create another short eBook or audio file, and give it away to the list. Put the giveaway on the page where they have to Tweet or Facebook share your link in order to get it. You can use Cloud Flood to achieve this. That way, even if they don’t buy anything, they are helping you to grow your list, and you’re more likely to elevate your “expert” status. Remember: The information above is to be used as a guideline. Please test your own subject lines and sequences to see what works best for you. You may be able to go for the product pitch sooner, or it may work better to go for it later. Don’t be afraid to test your own ideas. The advice in that previous sentence is probably the key to my financial success at the moment. One thing I’ve noticed with product launches – especially the Cloud Blogging launch – is that a lot of people will click on our Buy Now button, but not actually purchase the item. There is a measure for this called the “Cart Abandonment Rate” and our CAR was as high as 90% on some occasions. I spoke with a few people on this topic, and watched some relevant marketing material, and was told that I should add a step between the sale and the Add to Cart screen. The reason people are more likely to click on an Add to Cart button in the first place is because it doesn’t imply commitment compared to words like Buy Now!. Therefore, if you’re sending that traffic to an instant payment page, they often back out of the deal. The step, they told me, was a good place to insert product testimonials so further convince people that your offering is good. Instead of adding an entirely new page, I took advantage of a little known feature in Paypal. The ability to add your own header to the Paypal payment pages. In this header I used a testimonial from one of our customers. Thanks to this, our cart abandonment rate has decreased dramatically. I’ll continue to test which type of phrases work best, but I’m very happy with the results so far. The picture also needs to be hosted on a secure server to prevent people getting encryption warnings when checking out. You can use a free service from e-Junkie called SSLPic to upload your graphic. Then in Paypal simply head to Profile > Custom Page Design and enter your graphic URL in the header image field. May more sales start coming your way. I can’t tell you how well this works, since I’ve implemented it in a number of different ways. Going by my own experience and general logic though, I think this is something that every product creator should look into doing. One of the biggest benefits of Cloud Living, without question, is that members can communicate with each other freely. At the bottom of every video in the course there is a comments section where people can ask questions and discuss things with each other. Just four months into the product, there are now 1,700 comments on the site. This not only adds a huge amount of value to the product, but shows new customers that this is a real product, that real people are using, and they can join this productive community as well. On Cloud Blogging, I did things a little differently. First of all, the ‘Start the Course’ link in the members area takes you straight to an introductions page. This allows every member to share a little bit of information about themselves and really helps to build a solid community around the product, which I believe helps more people to take action with the advice we give. Right now around 15% of our members have left an introduction (55 at the time of writing this) and myself and Diggy have personally replied to every single one. Whenever we reply to someone, they get a notification in Facebook, which I think helps take the community aspect of the product even further. What would you rather purchase: An eBook on a topic, or that same information on a site which also allows you to ask questions and interact with other product buyers? I don’t think the choice is hard to make. Even if you don’t run a membership site, you can still incorporate more community aspects into your offering. If you sell an eBook for example, you could simply send an email to all buyers asking them to introduce themselves on a private page of your site. Use something like Disqus or Facebook comments on the page and watch the discussions begin. It took me weeks of testing and multiple product launches to figure out these strategies, but I can personally guarantee that they work well. Of course, I also tested a number of ideas which didn’t work so well, but I’ll save those for another blog post. Now, just send me 10% of your extra sales and I’ll say we’re even ;). I lost ‘First’ on my own blog? I’m honestly not the kind of guy that usually makes a comment. Although, this post was so great that I couldn’t avoid it. I been at this for 9 months and I been struggling a lot with marketing. However, when I read your post you always give me new inspiration and ideas to try different approachs. I know eventually I will succeed. Yo Glen..lots of people look up to you online..so this is why when you speak..they listen. This the key ot being successful if you want to continue to grow online. You must be yourself and let people follow you to the end of the rainbow. Because you have done the things people want to do..so this is why they come to you when it time to learn new strategies..thanks bro for all the help..
Ha, powerful but true stuff. It’s definitely the honesty shown on this blog that makes it easily one of my favorites, and while short term Glen may be “giving away” such good knowledge, the fact that he continues to provide quality is what keeps his subscribers (us!) so loyal in the long term. Something to learn from definitely. Glad you’re enjoying the posts Gregory. No problem, glad to read your posts. I had a question for you if you have the time to answer: I’ve seen that you have an earlier eBook published on PluginID a while back, ’09 I think: do you feel that the information in this book is still relevant for today? Anyways, thanks for providing such a great resource with this site. I believe that would be ‘Cloud Living’, just wondering how applicable you felt it was to today, considering it is from ’09. Solid strategy. The part that stood out for me was the part about testing headlines. So important. Use to be google friendly headlines were all the rage…nowdays, (with twitter, facebook ,and what not) emotional headlines get more play (from social media anyways) …Some people even start with a human friendly (emotional headline) and then a week later (after the socila media share-storm is over) they change it to a google friendly headline . I personally use both. Check out the post on ‘social media strategy’ for example. The post headline and site title are fairly different. “There is no business in the world that will make you more money than the business of trust” If you can get people to trust you and your judgment (Because you offer great content, great products and don’t go out of your way to scam them) people will just about buy anything you offer them. Now I don’t want to make this sound negative, but it’s true. It’s all about trust, and one of the great ways of gaining it is giving stuff away for free. Good stuff obviously, with the promise of even greater things to come. I’ll be looking long and hard at cloudblogging while I set up Binary Lotus, and doing everything you (and Dirk) say -> Because I trust you two! Totally agree with you. It’s why I kept mentioning things like “if it’s true” in the post, especially on the email strategy. Can’t wait to see you on the inside. Great posts. I see some magnetic sponsoring principles at work here, but I really like your specific autoresponder email dates and headline suggestions. Is “magnetic sponsoring” a product? I am Monetizing my blog with adsnese and it doing not much what i was excepting before i got approved from adsense, I think people are more clever now and they don’t click on ads now a days. I think i will be searching for any ad network that pays pat per impressions. Guess while I was reading a few more commented…damn. Thank you for sharing these tips! I have just started to try and monetize my blog and these tips will come in handy. Thank you. If you implement it, let me know how it goes. The only thing that has set you apart is the level of transparency in your writings. Your case studies are just wonderful. Thanks man. I’ve never used any product by Jeff (though I’m on his list) but I only hear good things. So funny, you speak and act like him. I just compared his email series for product launch and I felt he was writing for you or you’re writing for him. :-) kinda interesting. Like I said, prepare to start being called a “Guru”. I just finished reading cloud niche email and oh mine!!! You’ve blown me away again! Sincerely, that tip about refrigerators was a killer, couldn’t believe it. Today’s tip was worth at least $97 if only a little skin was put on the info. Your awesome Glen. Seriously:-) I’m not flattering you! This post is actually a really good resource for anyone with a list, a product, or both. I personally often cancel out of the add to cart section for the main reason that often this is the only place where I can find the price. I can see how adding a testimonial there could be the crucial deciding factor. I know it would work in my case for example. If I am interested enough to want to know how much it is, then THAT little bit of copy could be the clincher. A perfect example of how NOTHING should be overlooked and even the little tweaks can make a hige difference to your overall conversion. I also think that you add something a lot of marketers fail to add to their listbuilding/product launch campaigns – logic. Think like a customer and it becomes so much easier. Great post man. I love the detail and the step-by-step you provide — makes everything super understandable and straightforward. Getting a lot of great free content does make people feel like the have to buy something from you. Thanks for another wonderful post brah. Awesome posts Glen, as usual 😉 I will try some of them immidiately, but I have a question, how do you measure the “Cart Abandonment Rate”? is there an option on Paypal?? I’ve had a few emails about this already. Surprising! To be honest, my set-up is pretty ugly. I do track it (though the tracking is not perfect). The easiest way is to implement some form of goal tracking (ala Visual Website Optimiser / GetClicky / Google Analytics) for when people click on your Add to Cart button, and then view sales for the same time period of the clicks. Always top noche content Glen. I always have to read your stuff a few times to really let it soak in. Enjoying the Cloud Blogging HQ info so far. I have tried and failed at email marketing. In the past I just didn’t have a clear strategy and it showed in my results. This post couldn’t have come at a better time for me because I am going to experiment with this on my site and report the results. We will see what happens. I am however waiting on ViperBar plugin premium. Hope I’m not blowing that load prematurely but I have an idea (thanks to cloudblogging, which is a great product btw) of how I can spread my free content around by loading down with your most recent products i.e. using cloudflood. Good to hear I’m making things easier. I’m loving this site more and more. Got here from Pat Flynn, been reading for a few weeks, very nice. Now how to implement for my niche! Need to think. I really am both impressed and surprised..
impressed – This is pretty comprehensive coverage and I wonder how many hours you put in to actually write this much 🙂 Also, the fact that I learned a lot from this..
surprised – that you shared these tactics out in the open. It could be that one of your competitors might use this and might end up benefiting from this more! BTW, I think that Viperchill’s alexa rank increase this much due to your viperbar plugin which included lots of various links from many big blogs. Great Strategy, Glen! I don’t actually think that helps, though I may be wrong. Traffic levels to the site have just simply been far higher than normal. You offer so much valuable content for free on your blog, I can only imagine what you must be offering on your paid product. I have just started blogging myself, only a couple weeks in (journal of me building my online business!). Once I have started making some consistent money you can guarantee I’ll be signing up to look at what you have to offer! Woh woh woh. One amazing post. Those are some very pretty guidelines you got there. I won’t be able to benefit much from them but I can surely try implementing them once I launch my product which should be some time this year. I’m really glad to hear you enjoyed the post. Hi Glen, I’m really impressed with this post – there’s so much useful stuff here, I think I’m going to print it out, and go at it with a hi-lighter! I love hearing things like that. Congrats! This post couldn’t have come at a better time – I’m just working on a new info product. That’s awesome to hear. No problem! This further proves the importance of interaction since a lot of people get way too much information than they cab verify they need to see that it’s an expert giving them information and they can get answers to their questions whenever they want. I think this is what makes you unique, you do a lot to make sure your readers are interacted with. I also love your email product creation approach and this goes further to prove the power of an autoresponder – everything can be set on autopilot. Did you hear your name on the Cloud Blogging podcast? I’m really enjoying Cloud Blogging. You guys are doing a great job and that again goes further to prove the authority behind the Viperchill brand. Nothing has changed here. Glenn continues to be a game changer and the best in the industry in producing quality, detailed content. It amazes me how your quality never drops. Its another really interesting read and one I need to read again to take in all the information. Thanks again Glenn and continue to produce the sensational content. Glen! Thank you!! This was precisely what I was trying to strategize just YESTERDAY…esp #2. And it’s truly amazing that you genuinely interact with your readers. I appreciate this post, all your products…and most of all, your values. I’m really glad that the post helped! Thanks a lot for the comment. Sorry to hear about the Nigeria exceptions. I think the reason for you selling so well is that we can already know that the quality will be. I’ve noticed a lot of your comments over at TechCrunch lately – nice to see you’re also a fan. Glen, you rock mate! Thanks for the awesome advice as always. Glen, with every post you make, you prove yourself truly worthy of the “guru” moniker. So glad I joined Cloud Blogging! Posts like this are simply amazing and it’s an honor to learn from you. Thank you for the kind words. I appreciate the comments! Brilliant! And perfect timing as I consider my own product launch in the next couple of months. I have taken copious amounts of notes. Thanks! This is the best blog post in your website ever. And you earned one customer out of this. I just bought your cloudblogging program for $47! Hah, glad you like it Deepak. I haven’t known all of these strategies. I think it’s help me. Thanks! This is some high quality content. Some people would pay to get your tips. Thanks for giving them for free. I’m sort of new to social marketing so this read was invaluable. What would you recommend for setting up a “subscribe” service for a newbie like me? Feedburner? Mailing lists? I built my first blog while working a full-time 9-5 with a hectic social life. My favorite take away from the post was regarding changing things up and doing what works by going against marketing conventions and adding another step in the checkout process if it makes sense. Little things like that add the touch that you care and add service to the sales process. i used facebook comments box, like buttons, fan pages on my blog and now enjoying the best automated traffic. Thanks for a great article Glenn, its very appropriate for me at present as I’m working on my first product launch. Will let you know how it goes. Great article Glenn, also just bought CloudBloggingHQ and will be recommending it to others, awesome awesome resource! Catchy title and quality post as always! To anyone who’s running a blog and hasn’t gotten Cloud Blogging yet, we really spent a huge amount of time and effort making it the most definitive guide online to building a successful blog. What’s even better is the interview-series with 10 A-list bloggers like Pat Flynn, Michael Dunlop, Tina Su and many more. I have to agree strongly with the point that many MMO bloggers seem to make money by talking about making money and their real experience is actually fairly limited. Some of the better known bloggers just seem to sit back and post affiliate links to products. Fair enough I guess but I for one am starting to unsubscribe from those that have given up on posting anything “useful”. Having worked for a large commercial site in the past (proper big, it was sold for a 9 figure sum, and that’s pounds not dollars!) I got to see a lot of what goes on behind the scenes. Email marketing was of course a big earner by most people’s standards, we had 1m+ subscribers and employed 2 people to coordinate targeted emails, however as a percentage of the mix it was less profitable than PPC, natural search, brand lead search, etc. 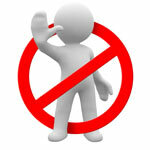 Email lists work, but be weary of those that say it is the only option. Especially when promoting mailing companies that offer a cosey life time affiliate scheme! 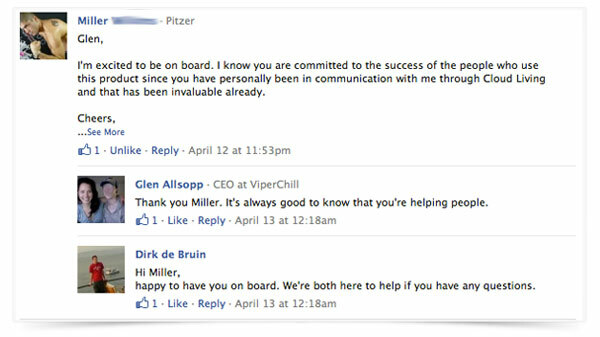 I really like the idea of utilizing Facebook Commenting to collect and promote testimonials. If you have a service rather than a product, do you recommend just having a dedicated testimonial page on your site somewhere. I like the added (though small) SEO benefit of testimonials not in iframe format, but I think using Facebook is a great way to record testimonials in a social fashion. Great article, I always enjoy your writing but almost find it not useful at all. I am an affiliate site for shoes so I sell for Amazon, heels.com, etc, etc and not sure how to implement your techniques, any pointers? I have had problems posting comments on your blog – they are not showing. Am just testing chrome to see if it is firefox causing the problem. think I have isolated the problem – it’s firefox that is not working. Has anyone else had this problem? Discovered your blog recently and now reading some of your staff. It’s awesome, thanks! I really was interested in the discussion of interoperability (i.e. Facebook comments being moved to different pages as needed). Thanks for a great post, Glen! The paypal thing by itself is pure gold! I will implement this immediately, I think it can dramatically increase sales! The Facebook comment plug-in I will use as well. Excellent point on the PayPal header trick. I’ve seen some dramatic improvements in conversion rates by playing around with that final sales push. It’s the most important of them all. I’ve been anxious to try the Facebook commenting box on a landing page but, well, I have to get my paid product up already – heh. So, your Copyblogger guest post went up recently and I don’t believe that your Pro Blogging screen cap (in the video at top right) just HAPPENED to freeze on Copyblogger. Nice, my friend. The Force is strong with you. By-the-way, that 2-video series is straight money. Thanks and although I have seen CB use their nav items to push traffic onto landers/opt-ins you’ve nudged me to actually get my own created. Should be easy since I bought Premise. Thanks for such a comprehensive post..it is nearly as meaty as many products that are for sale in internet marketing.. This is the great strategy Glen. You are awesome. Thank you. Schweet idea having the testimonial image on the paypal page – and I have an improvement. We have over a dozen products we sell, so rather than set the logo (testimonial) URL in the Paypal “page style” (limit 3 styles), you can set the url in a saved button. This will change the logo / testimonial image per button / product. I came here from ViperBar settings page and its true you can create really killer titles. Worthy strategies and you’ve explained each of them excellently. There is much more to learn from you and subscribed. Am pretty amazed by your success and right now read your invaluable advices about getting more traffic to and optimizing a blog. Wish you all the best and keep on going! I know that list are so powerfull, but do you have any tips and strategies on how to create a big list, other than already owning a popular blog and offering something for free ? Thank you for another enlightening post. I’m happy to say that I’m already on the way to implementing many of these ideas. It’s a relief to know I’m heading in the right direction. I will take a look at the Facebook commenting system and list automation next. Glen as an 18 year old high school student your extremely inspiring. Your intelligence in the SEO and online marketing field is astounding and your a role model for people all over the world trying to make it big online. You prove time and time again that your strategies and hard work really do pay off. I’ve read just about every one of your posts thus far and look forward to more in the future. Im already subscribed here and to cloud:niche which im pretty excited about. If i currently had a steady income I would purchase your Cloud Living course in a heart beat. Keep on doing what your doing cause it’s definitely working. I do have just a few questions that i hope you could answer. 1. When and how did you learn to code and create software such as your cloud flood application? 2. What hosts would you recommend for someone just starting out or someone who is starting to build an audience/getting a decent amount of traffic? Thanks alot man, your a true role model. 1. I can only design websites – I can’t program. I hire people to do that kind of thing. Everything in your post makes perfect sense. I love strategy 2 very much. Free helpful information is very rare these days and you made a big difference for most of bloggers. Strategy 3 is also great. The Paypal checkout testimonial will provide strong evidence of how the product really works and it draws in more customers and more readers, increasing your sales rapidly. You’re awesome bro! I really enjoy reading your blog. I think it is great that you are more interested in helping others make money than you are yourself. It says a lot about Viper Chill’s image. It makes me want to continue visiting your blog. I am astonished that your are 22 years old. Very inspiring, keep it up. Do you ever offer a more personalized consulting video/skype/email… etc? If you do I am intrigued by that opportunity, if not I will continue absorbing what I can from ViperChill. Thanks. Great post. I find that it can be really hard to sift through all the noise and find truly valuable information. I think its great that you are looking to take a more personal touch because I know that helps me trust in information that I find on the web. People who are willing to put a little bit of their own personality into their work are taking more of a risk and showing more sincerity. Veri informative post. It’s really help the blogger to make their own strategy. I just build a new website and all Tips on promotion are very helpful. I heard lots of good things about Power of Blogs, but nobody tells you where to start. Thank you for sharing this post, I learned alot. I was unaware that we can change the header graphic in paypal checkout page. Sounds It can prove really beneficial. Moreover the fact that most marketers keep the subscriber in the freebie list even after they have purchased the item is quite annoying. I had this with me a lot of times. I purchased a product 4 months back and still I am receiving the promotional email about the product from the seller. Rest assured, the strategies mentioned in this post are going to take me to another level. Thanks for sharing. Hey Glenn – this is an awesome post. I think I like the Paypal section most because I was aware of the trick and had not yet figured out how to do it – thanks for the details. there are only few people or bloggers who gets my attention and yours is great so far. thanks for this, i never thought that the paypal testimonial thing really exists… i have a seo service website and i’m still improving it and maybe i could add this up. thanks Glenn! This is a great post, thank you for those ideas. I had recently told my husband that I need to totally concentrate on my site and my blog and make it profitable, as a business and this will certainly help. Thanks Glen, am enjoying your emails. I think the hardest part about blogging is having the discipline to do it frequently. I know you say inside your 10K report you blog pretty much when you want (ie. you dont abide to the “must blog daily rule”) but I do find creating a goo habit like writing daily a big help. Once I break the habit it becomes a tough slog to get back into things, routines and systems. I read your article and I must say that I feel more positive about my blog. Recently I posted a job to freelance sites like http://www.peopleperhour.com/ and flver.com and I am thinking of hiring a freelance work er to do my SEO. I will see what I alone can and can’t do and then I will listen to their advice. It is invaluable that nowadays we have the tools and advice freely on the web. I still remember trying to build a site with MS frontpage…. I read this post in one stop. Thanks for sharing. Your link to Cloud Living at the bottom takes you to a website that is no longer active…. Did you get rid of the site? I find myself hard to believe that I did not pay anything for the useful information that i’m reading now. Such a great teacher. I actually found you on iTunes a few weeks ago. The only downside is that there are so few episodes. I’m sure it’s quite a time commitment to them. I did want to say that you are much better at podcasting than you think. I’ve been perusing your website over the past couple of days. It’s an amazing wealth of knowledge, here. I appreciate you sharing your insights with us. Thank you! Awesome post.This is really an eye opener for me. Thank you for the article. It is a worth to read article. A great post. This is what i really need now because I’m having problem with my monetization strategy. This is a really smart post – especially the “PayPal checkout testimonial”. I never knew you could do that! I’m going to try that with some of my products and see how that works out. BRILLIANT. The part about autoresponders was good too – although I always worry about bombarding my readers and being a pest. Perhaps I need to rethink that. Thank you so much! The PayPal checkout testimonial was an interesting addition. I am going to try that if I go ahead to sell some product on my blog. Thanks Glen for sharing your experience with us.